i've been continuously bustling these last few days. waiting for the cable guy, many trips to the grocery store, making our house a home. last night, i placed a meatloaf in the oven and we were off to pick out our first christmas tree. by the time we got home, the house smelled delicious and our supper was ready to be dished up. i have been working hard to make our house a true holiday home. the fire going certainly helps. as does the 'holiday sage' candle burning. 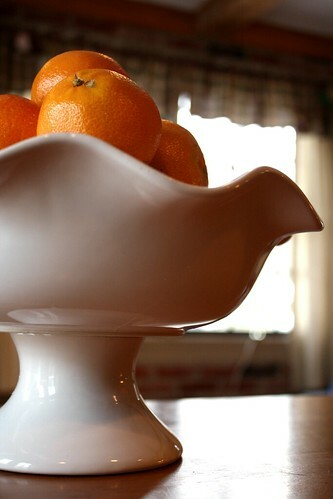 and the ruffly white bowl filled to the brim with juicy clementines. we watched charlie brown's christmas on tuesday, and i put together a basket of greens for the front porch. (my $4 thrifted basket, that is). and did i tell you about my sled? found one a thrift shop for $18. i've had my eye out for one and was holding out until the right one came along. i picked the antique-est, rustiest one i could find and it looks perfect outside our front door. just right next to the basket of cinnamon-scented pinecones. i hope to share some photos soon. as for tonight, we are looking forward to homemade hot chocolate, christmas tunes and the trimming of the tree. 800 bulbs here we come.